We have apps to monitor all kinds of things that our body is doing, like tracking our blood pressure, measuring our running pace and keeping an eye on our eating habits. 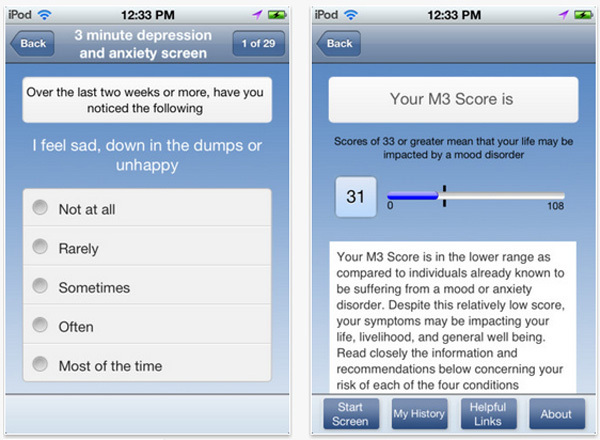 There are also plenty of apps designed to monitor your mood, but WhatsMyM3 takes that data and turns it into an M3 Score, which could help assess your risk of some mental health issues. The app is based around the notion that in just three minutes you can detect whether someone could develop depression, anxiety, bipolar disorder, or post traumatic stress disorder through a series of specially selected questions. The app gets the user to answer each question and rate their responses, then provides them with an M3 Score that either tells them they’re doing OK or they need to make some change in their life, read more materials, get some medical help or just keep an eye on their score in future to see if it changes. Although assessing your mental health is a rather grey area that we’d recommend you consult a doctor about if you’re unsure, apps like WhatsMyM3 provide people with the power to figure out whether they have an issues and need to seek further help in the future.